Make sure this part fits your car. Contact us to verify fitment! Take a tour of nostalgia, unique design and reliable engineering that has been Mercedes-AMG time-tested mark. 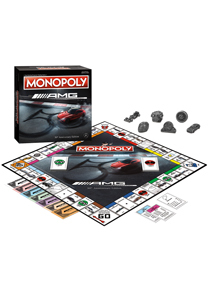 Own all the makes and models that made history, as you buy, sell and trade your favorite Mercedes-AMG vehicles! Legendary Race Circuits will take the place of railroads. Instead of paying Taxes, you will pay Insurance and Registration. Take a Chance on Pit Road and find luck on Victory Lane, replacing Community Chest.